Walpole Highway is a large parish in the very west of Norfolk, on the border with Cambridgeshire. It is situated in the West Norfolk Local Government District, and has an area of 1045 hectares. The name ‘Walpole’ is thought to derive from the Old English for pool by the wall, and may refer to the Roman bank which encircled a number of the Marshland parishes. ‘Highway’ refers to the main settlement which is situated on the road between Walton and Terrington St John. The area of this parish was previously the southern part of the now dissolved parish of Walpole St Peter. Large parts of the parish are former salt marshes, mostly drained only during the last two hundred years. As a result, it is thought unlikely that any occupation would have been possible during the prehistoric period, and no evidence for prehistoric settlement has been recorded. However it is known that the tell-tale signs of early Iron Age watercourses can be seen as soil marks or occasionally as earthworks across the parish, and a number of these have been noted crossing seventeen separate sites (for example NHER 19622 and 20695). The first evidence for occupation of this landscape is therefore in the Roman period, and extensive fieldwalking by the Fenland Survey during the 1980s has provided good evidence for small-scale land use across the parish, though particularly around the edges of the Iron Age watercourses (NHER 20885 and 19672). Sixteen concentrations of Roman pottery sherds have been noted in this parish (such as NHER 19585, 19672 and 20849), some of which have included other material such as bone (NHER 20850) and shell fragments (NHER 19625). In addition, Roman pottery sherds have been recovered from another twenty one sites, though in not in enough density to be considered occupation sites, and a single Roman coin has been recorded (NHER 18629). Compared with the occupation distribution to the north, in the parish of Walpole, the density here is far greater. Assessment of the evidence gathered suggest that settlement did not commence here until the 2nd century, and probably reached a peak in the 3rd century. Unlike the Roman period, no concentrations of Saxon pottery have been noted, although a small number of scattered sherds have been recorded (NHER 19622, 19623, 19678, and 19680). Settlement during this period appears to be focussed on the later northern settlements of Walpole St Andrew and St Peter, in the civil parish of Walpole. However, the area becomes increasingly settled during the medieval period. The most pronounced features of the medieval period landscape are the west and east droves, which run along the Trinity and Mill Roads to the east, and the Walpole West Drain to the west. The remains of these droves, along which animals would be driven, can be seen in the fields on either side (NHER 19670 from the East Drove and NHER 20884 from the West Drove). Also of note are the remains of a moated enclosure (NHER 2207), which may have been the site of the Rochford mansion. Pottery sherds, brick and fired clay fragments have been recovered from inside of the enclosure, of which the north and parts of the east and west side survive. Artificial mounds have also been noted just to the north (NHER 19860) and south (NHER 19805). These are probably the results of attempts to raise dwellings higher, probably in order to protect them from flooding. A third mound (NHER 19868) is situated very close to the site of a medieval chapel to St Edmund or St Catherine, and its size and location is thought to indicate that it may have been the site of a large, perhaps even manorial, house. Whilst the above moat and mound sites form the focus of settlement around the West Drove, no focus has been noted in the occupation noted along the East Drove. West Drove also seems to have been the most important and the most populous, with sixteen of the parish’s twenty-three medieval object concentrations near or on this drove. In addition, pottery sherds have been recovered from another fifty-one sites across the parish, probably indicating the spread of medieval manuring. Post medieval debris has also been recovered from some twenty sites in the parish (such as NHER 19588, 19695 and 50205), and a few metal objects have also been recovered (NHER 30661). In addition, two post medieval buildings of architectural interest have been recorded. These are Trinity Hall (NHER 18479), which is a heavily altered 16th century building, and Faulkner House (NHER 18480), a three storey late Georgian house. Also of interest is Cooper’s Mill (NHER 4473), a former wind mill dating to the late 18th or early 19th century. 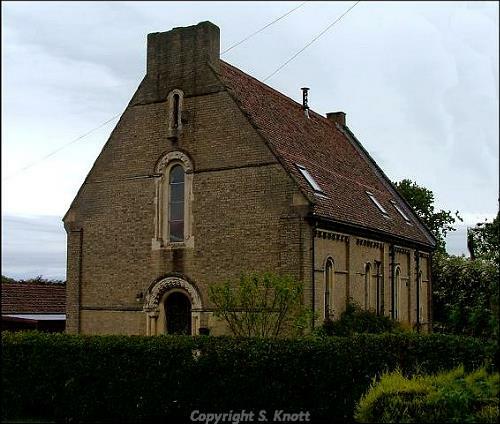 Also of interest is St Edmund’s Church (NHER 4476), a chapel of ease built in a Norman style in 1844.